Sports injuries, workplace injuries, musculoskeletal disorders such as headaches, neck & back pain, sciatica, shoulder, elbow, wrist & hand pain, hip, knee & ankle pain, Achilles pain, shin splints, plantar fasciitis, acute & chronic pain and post op rehabilitation. We also treat musculoskeletal injuries in children and teens. Musculoskeletal physiotherapists are experts in the assessment and treatment of disorders involving the spine, joints, muscles, ligaments, tendons and nerves. The aim of physiotherapy at Back2Balance Physiotherapy is to reduce pain whilst restoring function and mobility. It is important to discover the source of the problem therefore you will undergo a thorough assessment allowing us to treat the cause of the problem not just the symptoms. You should expect a large proportion of your physiotherapy session to include “hands on” techniques such as joint mobilisations, soft tissue massage and muscle energy techniques, alongside other modalities such as electrotherapy (eg. Ultrasound therapy), acupuncture/dry needling, taping and exercise prescription which may include Pilates exercises. Back2Balance Physiotherapy does not provide Pilates classes; we provide exercise rehabilitation also known as group Physiotherapy classes. Our exercise rehabilitation classes can be undertaken as one on one, duo or in a group environment. There is a maximum of 3 participants in a group class. These classes incorporate a blend of clinically appropriate exercises, some of which are Pilates inspired and utilise Pilates equipment such as reformers, trapeze table (Cadillac) and Wunda chair. 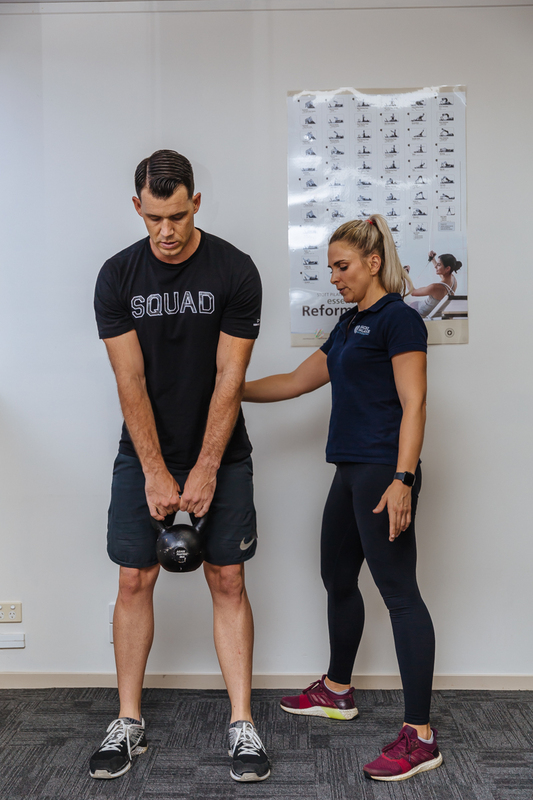 All our Physios are trained in exercise based rehabilitation and utilise techniques from the specific methodologies they are trained in eg. Clinical Pilates, strength & conditioning training, kinetic link training, Yoga, stick mobility and F45. You will find your program will be a blend of some of these methodologies. 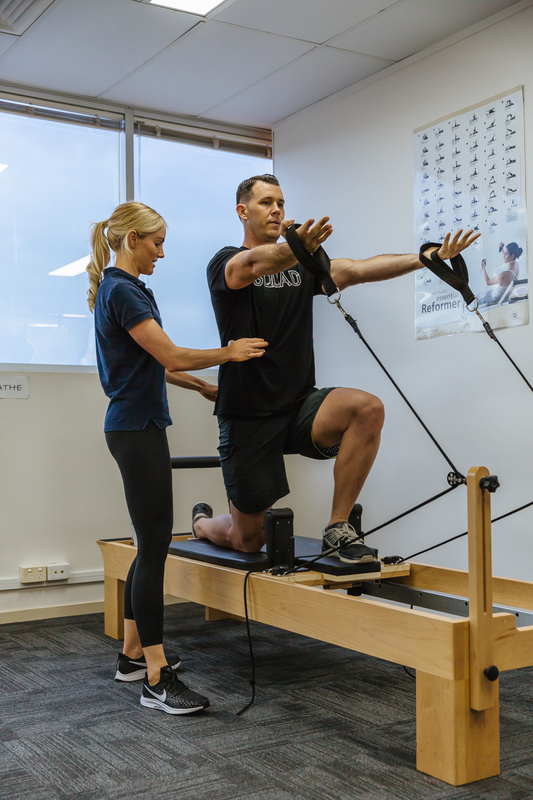 All classes are tailored to the rehabilitation needs of the client and a program is devised following a thorough functional movement assessment. During a group exercise rehabilitation class all participants will be completing their own individual program with the guidance of a Physiotherapist. These programs are regularly modified and upgraded as your rehabilitation needs change. Sessions last for one hour with most private health funds offering a rebate under Physiotherapy code 560 with Extras cover. The changes in the health reform that comes into effect from 1st April 2019 only allows rebates for rehabilitation post injury/surgery/pregnancy and does not allow claiming for fitness based exercise. 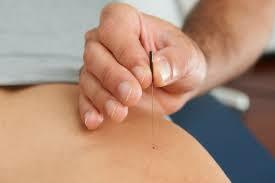 Acupuncture or dry needling is offered alongside physiotherapy treatments as an adjunct to physiotherapy. Acupuncture is based on Traditional Chinese Medicine where a fine needle is inserted into specific points within the body to stimulate “Qi” (or chi). TCM believes that there is energy known as “Qi” flowing through the body and pain is due to stagnation or a blockage of “Qi”. Energy channels known as meridians are present throughout the body with acupuncture points distributed along. Acupuncture to the affected meridians stimulates healing and relieves pain by creating and increase in the flow of “Qi”. Dry Needling is the Western form of acupuncture which is based on the physiological response achieved with evidence based practice to support its use. Dry needling is used to eliminate trigger points (taut bands) within a muscle. Trigger points and traditional acupuncture points tend to overlap. At Back2Balance Physiotherapy Lyndsey trained in traditional acupuncture and has since developed skills in Advanced Dry Needling. Louise, Tim, Melanie and Angie have all completed training in Advanced Dry Needling. Did you know that up to 80% of runners will be injured in a 12 month period? That’s 4 out of 5 runners. Worried? You should be. No one wants to be injured and not many runners are happy not to run. Knee pain is the most commonly reported injury in runners, but you can injure almost any part of your body. The good news is that your physiotherapist can help you run injury free and run further and faster (if that’s your goal). It’s important to see your physiotherapist early if you are experiencing any problems when running. This can include blisters, uncomfortable shoes, chaffing, niggles, muscle pain or injury or joint swelling. Early diagnosis and treatment can reduce pain and swelling, prevent excess time away from running, limit recurrence of injury and help maintain your fitness through suitable cross training activities. While many people ‘just go for a run’ and argue that humans were ‘born to run’, this approach to running is highly likely to lead to injury. Running needs to be considered as a sport. You wouldn’t go and play a game of cricket or rugby without going to training during the week so why would you approach running any differently? Running requires specific abilities such as flexibility, strength and coordination. Our physiotherapists can help by assessing your current strengths and weaknesses and advise on which areas you need to improve. For example if you want to run faster you will need to do some speed sessions (i.e. train fast to be fast). Back2Balance conducts 1 hour video running assessment consultations as well as being able to provide gym and running training programs. We’re here to help get you back on the road sooner, so don’t put up with discomfort, come and see us at Back2Balance Physiotherapy today! Is lower back pain or a sore neck stopping you from getting out on the bike on the weekend? Are you watching in disbelief as your friends’ power past you on a climb and wondering why you can’t keep up, despite all your training? 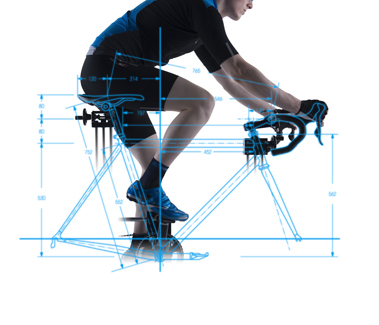 A bike-fit may be what you need. To get the very most out of your bike, decrease your risk of injury and increase your efficiency, your bike needs to be setup specific to you. Just as no 2 people are the same, everyone has different injuries, strengths and weaknesses. Your optimal bike set-up cannot be calculated with a formula. For example, someone with a long history of neck, shoulder and back pain may not be able to get into the same most aerodynamic position on the bike as someone without any of these injuries. As physiotherapists, we help treat your aches and pains, we help rehabilitate you from injury and we help you with your ergonomic set-ups at work. This puts us in an ideal position to help you set-up your bike and give you an unbiased opinion regarding any recommendations for shoes, cleats, saddles etc. As a keen cyclist himself Tim has undergone further education to be able to assess and modify your current bike set up. For more information on these services, please feel free to contact us or book in with Tim. Deficits in any of these 3 areas WILL increase injury risk and WILL absolutely limit performance output. The CrossFit community values the safety of its athletes emphasising technique and scaling workouts to individual capacity, but ultimately coaches are limited to providing modifications or substitutions during WODs for injured athletes. As CrossFit athletes themselves, our Physios Louise and Lyndsey are familiar with the movement and mobility requirements that CrossFit demands. They can diagnose and treat the underlying cause of pain limiting performance and provide the tools to manage and prevent problems. 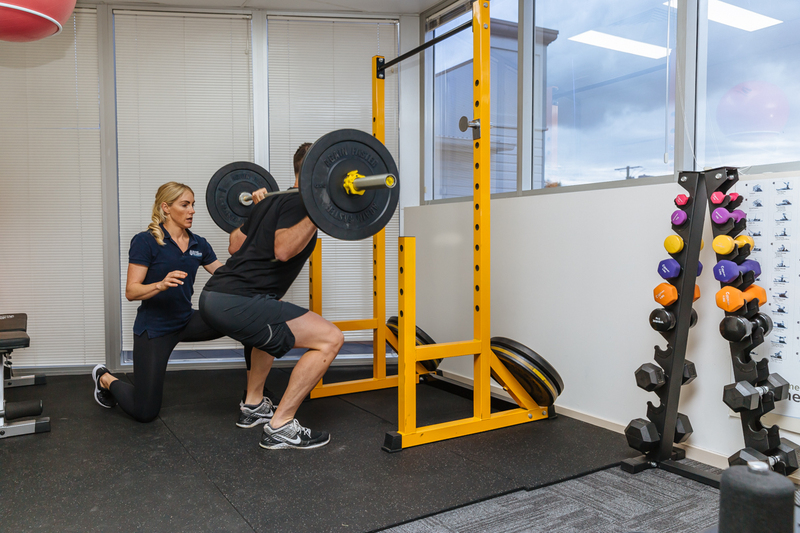 They will empower and educate athletes so that they understand their condition, achieve and maintain the mobility and strength needed to carry out their desired level of function while minimising the risk of injury. We successfully treat CrossFit athletes who range from teenagers to weekend warriors, and professional athletes to grandparents. Physiotherapy services can be utilised post-injury or surgery to aide in functional return, to assist in maximising fitness capacity when performance plateaus and can also be used as a tool for preventing injuries from occurring in the first place. F45 is functional training that involves both high intensity interval training (HIIT) and weight lifting. Anyone who has attended a F45 class will know how much jumping can be involved. Box jumps, squat jumps, broad jumps, lunge jumps….the list goes on. Did you know that repeated jumping can cause knee pain and/or overuse injuries of the lower limb? This is particularly true if you are new to performing this kind of activity or if your technique is suboptimal. F45 also includes loaded compound movements (such as front squats and deadlifts) which may aggravate lower back pain if not performed correctly. Similarly, overhead weights can cause an annoying pinching in your shoulder joints particularly in those who have tight upper backs from too much desk sitting. Our physiotherapist Angie is not only a long-term member of F45 but also a F45 trainer on the weekends. If you are new to F45, she is able to pre-screen you in order to prevent these types of injuries occurring. She can also give you advice on training volume and frequency when you first start in order to prevent injury. If you are already experiencing pain, our physiotherapists are able to assess and treat your injury to reduce your pain levels. We can then prescribe an individualised home exercise program that will complement your F45 training. 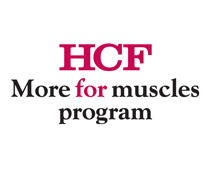 These programs can help to strengthen any weak stability muscles or mobilise/stretch any restricted muscle groups. This will ensure an improvement in biomechanics into the required movements and therefore less pain. Angie’s extensive knowledge of the F45 movements and classes, allows her to give you advice on which exercises to avoid whilst injured and which are safe to continue. This valuable information can keep you training around your injury. To identify the cause of your pain or injury at the earliest possible stage and provide you with a long term solution to your problem rather then just treating the symptom.